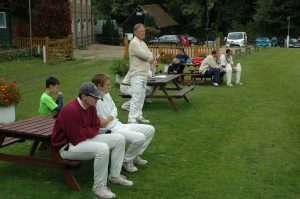 The usual scrambling around for players resulted in two teams (one of 11 and one of ten) assembling at the annual worm cast arena that is Betchworth Cricket Club (conveniently situated behind the Red Lion pub) for the Buccaneers’ end of season ‘House Match’. Julian kindly got the heavy roller out and we commenced at 11.15am with Simon ‘China’ White and Will ‘Farmer’ Rydon leading out the Kolkata Knight Rydons. Opening with spin for the Sunrisers Hyderhobbs was Angus ‘no sleep’ Berry and with pace Liam Ward (enough of the nicknames). Good cricket all round, despite the sticky wicket, and all was proceeding smoothly until Will fell to a straight one from Liam. Jeremy Milne took over and calmly bisected the field with what turned out to be the top score of the day, as well as the highest partnership. Will Metcalfe and young Alfie Harris-Jones joined the attack, but it was left to the skipper, Rich Hobbs, to spin one down the hill to account for China. Simon Leefe joined Jeremy to tackle the spin from Rich and Warwick Okines. Jeremy normally gets fifty and out, but decided to upset the form book by getting out on 49 to a caught and bowled by Rich. Rob Rydon departed similarly but with a lot less runs to his name. 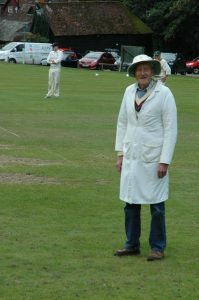 Now enter the septuagenarian, Andy Morgan, who started quickly in attacking the bowling with some swiftly taken two’s off another youngster, Arthur Bourke. The KKR’s lunched at 132 for 4 and all and sundry set about attacking the generous offer from the Buccaneers’ finance director of a tab behind the bar. A mixed affair for lunch, with some generously helping themselves to the Coronation chicken, Parma ham and hot scampi, while others were left with some salad. Sadly the rain started to fall, but this just meant for some a retirement to the bar and more ale on the tab. However, as the skies became less grey it was decided to restart but amend the game to 35 overs per side. Invigorated by lunch, Andy and Simon attempted to run a three, but sadly too much ale or too many years meant that Andy failed to make it back for the third. Enter young Charlie Leefe, fresh from auditioning for Trainspotters 3. He showed his dad how to up the tempo with an agricultural six over cow corner (befitting a soon to be student of Cirencester Royal Agricultural College). Not to be outdone, Simon launched a straighter version into the trees. Charlie fell to the wiles of Warwick, neatly stumped by Michael Harms and Tom Rydon enjoyed the short term nature of his innings, adding quick runs, before falling on the last ball to another Harms stumping. 182 for 6 off 35 overs seemed plenty to the KKR skipper. Angus and Michael opened against the pace of Tom and Ed Howes. A strong start. Some fours and a six got the scoreboard ticking along, but a lofted drive to long off was safely pouched by Will off Ed’s bowling. Liam joined Angus and the Sunrisers looked in command and ahead of the run rate until an excellent and entertaining run out took place. 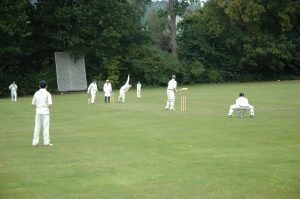 A direct hit at the non-strikers end was given not out (dubious) and as the batsmen attempted a run off the ricochet, Angus was run out at the other end. Simon L came on for some SLAB and accounted for the dangerous Liam, via a back stretching catch from China. Rob Bourke looked technically correct at the crease, while Rich looked less so. The Leefe combo accounted for them both before El Presidente came on for some ‘spin’ down the slope. Philip Harris-Jones was taken in the covers by China and Simon L cruelly caught young Arthur for a golden duck. In came the Hack, blowing like a steam train, and received the worst hat-trick ball in recorded history. Hack gratefully accepted the offer of a runner and enjoyed a partnership with Will M, his son-in-law. Will smote it to most parts of the ground and surrounding forestry while partnering Hack, then Alfie and finally Warwick. Declining singles, Will dealt in sixes before a fateful heave missed the ball and Andy deftly removed the bails off Will R’s bowling. 129 all out and Warwick left stranded, only a hundred short of his hundred. The Sunrisers’ skipper gamely opened his bottle of port in the pavilion to try and dull the pain of defeat and offered the least generous of speeches to Rob as he handed over the Mynott Thimble (think European Cup Winners cup, but on a smaller scale) in the Red Lion. Thanks to Marshetti and Chunky for gamely umpiring the affair and for James Stringer for arranging a modest lunch. Foolishly James departed to Wembley to watch a nil-nil draw between Spurs and Swansea when he could have been watching the Galacticos behind a pub in Surrey.